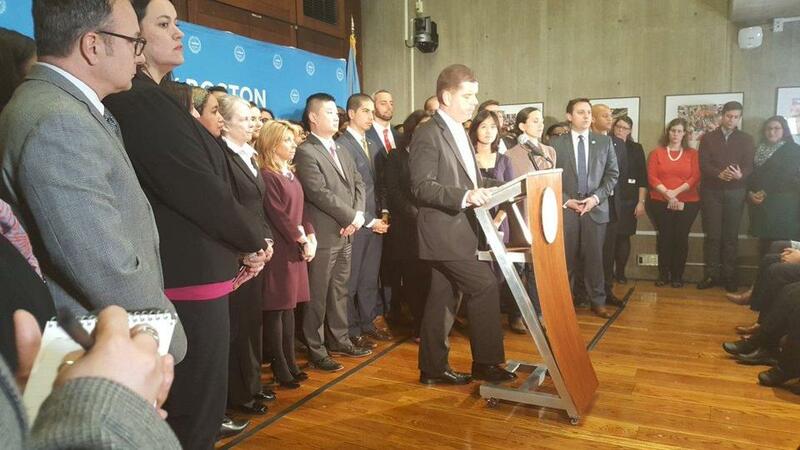 Boston Mayor Martin J. Walsh during a press conference on immigration on Wednesday. In some of his strongest comments yet, Mayor Martin J. Walsh lambasted President Donald Trump’s threats to pull federal funding to sanctuary cities and pledged Wednesday to shelter undocumented immigrants at City Hall as a last resort. “If people want to live here, they’ll live here. They can use my office. They can use any office in this building,’’ Walsh said at a Wednesday press conference at City Hall moments after Trump vowed to crack down on immigrants. In a show of defiance, Walsh — flanked by black, Latino, and Asian staff members and elected officials at the City Hall event — responded strongly following Trump’s press conference in Washington, D.C., in which the president signed executive orders aimed to clamp down on illegal immigration. The mayor vowed to use all of his power within lawful means to protect Boston residents, even if that means using City Hall as a shelter. City officials say Trump’s proposed cuts would harm the neediest residents and have vowed to fight them in court. Although Boston offers refuge to undocumented immigrants, it is not technically called a sanctuary city, a title used by other municipalities, including Somerville. Boston’s version of the 2014 Trust Act assures undocumented immigrants that the city’s police would not report them to federal authorities and is intended to keep local officers out of the business of deportation. Councilors have said the measure would ensure that immigrants see police as people who can help them and not as a threat. At his press conference, the mayor repeated much of what he has previously said during the presidential campaign as Trump railed against unauthorized immigrants – even under the threat of diminished federal funding. Walsh vowed to fight for residents, “whether immigrant or not” and provide the best quality of life for all Bostonians. Walsh lauded Boston and the nation as being built on immigrant contributions. Nearly a third of the city’s residents are immigrants and nearly a half have at least one foreign-born parent, he added. He also pulled out a letter that he said was from a 7-year-old boy that Walsh said he has been carrying around for two and a half months. The boy’s mother is undocumented, and he expressed fear that under a Trump presidency she would be deported, Walsh said. “Dear Mr. Walsh, I am thankful for you because you protect our city from a mad man and you would make me and my family feel safe,’’ the mayor read. City Councilor Tito Jackson — Walsh’s top opponent so far in this year’s mayoral race — also spoke out against Trump’s actions, saying he categorically rejects that the President has the right to tell Boston how to treat and take care of its residents. Jackson said the city will ensure that registries of immigrants do not go forward, young undocumented immigrants go to school, and victims of crime are able to call police without fear. “That is who we are in this city,’’ the councilor said. Meghan E. Irons can be reached at meghan.irons@globe.com. Follow her on Twitter @meghanirons.Cristela Guerra can be reached at cristela.guerra@globe.com. Follow her on Twitter @CristelaGuerra.